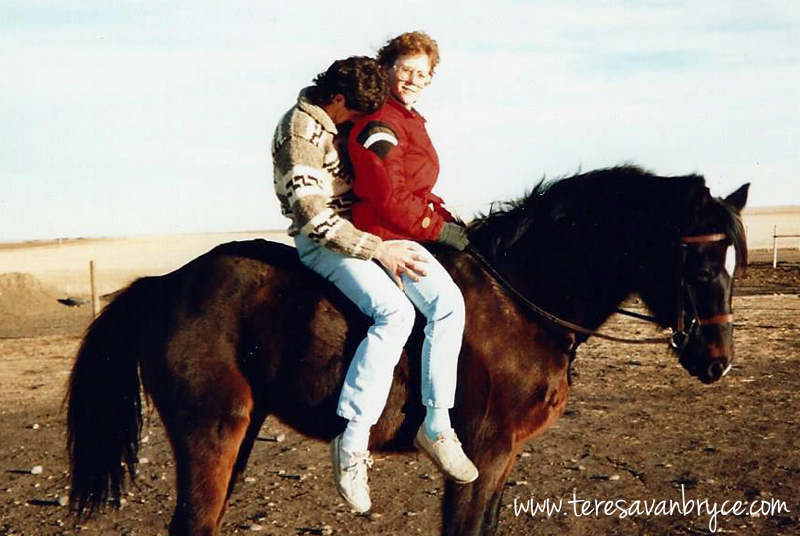 After a bit of a summer break, on with the story of Echo the Wonder Horse! 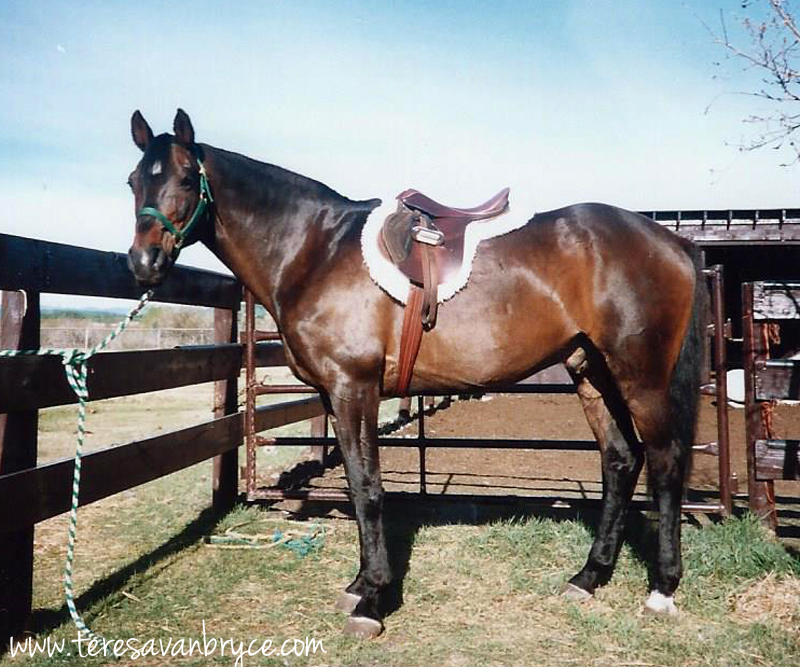 Following his quarantine period, Echo was turned into a 3-acre pasture with a few other horses where he went right to work establishing himself as the alpha. This took about ten minutes. He was a confident, dominant fellow. The evening after his turnout, I went to bring him in for a ride, and discovered another meaning to the nickname “wonder horse”. It was a wonder that anyone had ever been able to catch him! 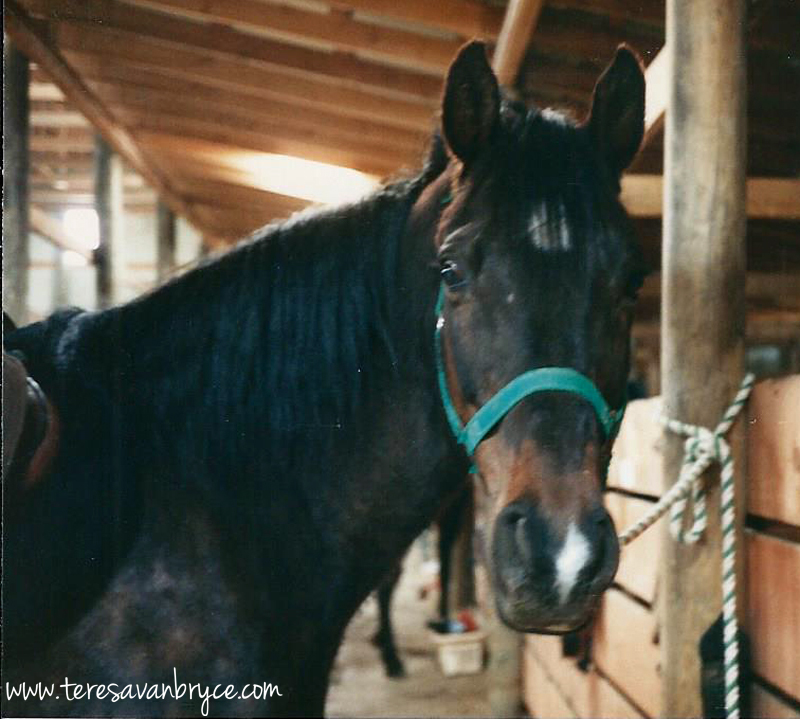 I spent an hour following him around that three acres, playing all-around-the-mulberry-bush with the dugout in the middle of the pasture, connecting the dots that his presence in the small corral when I first went to see him was not for my convenience but out of necessity. I was running out of evening so recruited assistance and, once we had him cornered, Echo walked right up to me as if to say, “Oh, were you wanting me?” Right. Despite my frustration, I gave him a few treats, something the previous owners said they’d never done, not believers in hand feeding horses. 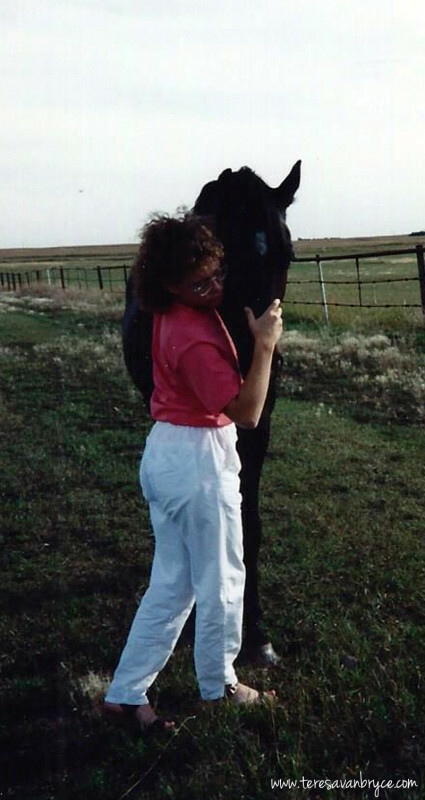 Hey, if it would spare me an hour of chasing around a field in riding boots, he could have whatever made him happy. You got more of those treats? With the doling out of treats on a regular basis, Echo came around to the idea of walking up to me, or at least waiting until I walked up to him, when I went out to catch him … most of the time. 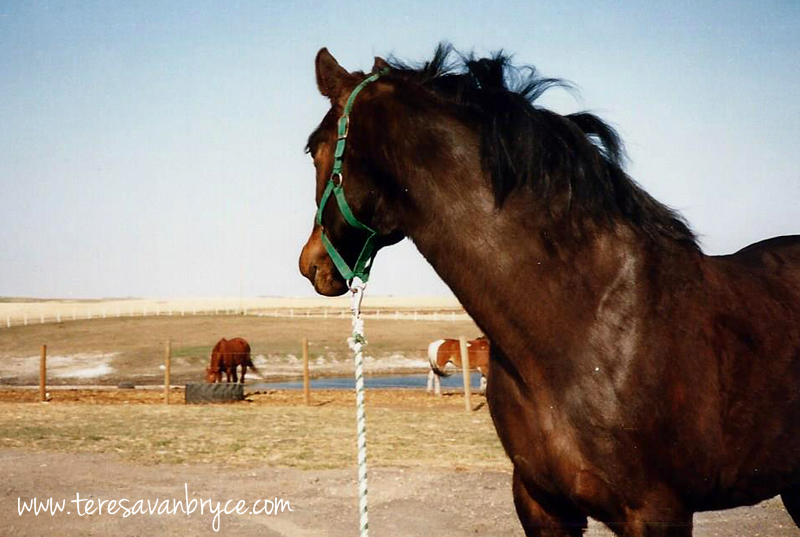 Every now and then, over the twelve years we were together, he would walk away from me and let me follow him around the field for a bit before he’d turn toward me. I think it was his way of reminding me that he didn’t have to let me catch him. 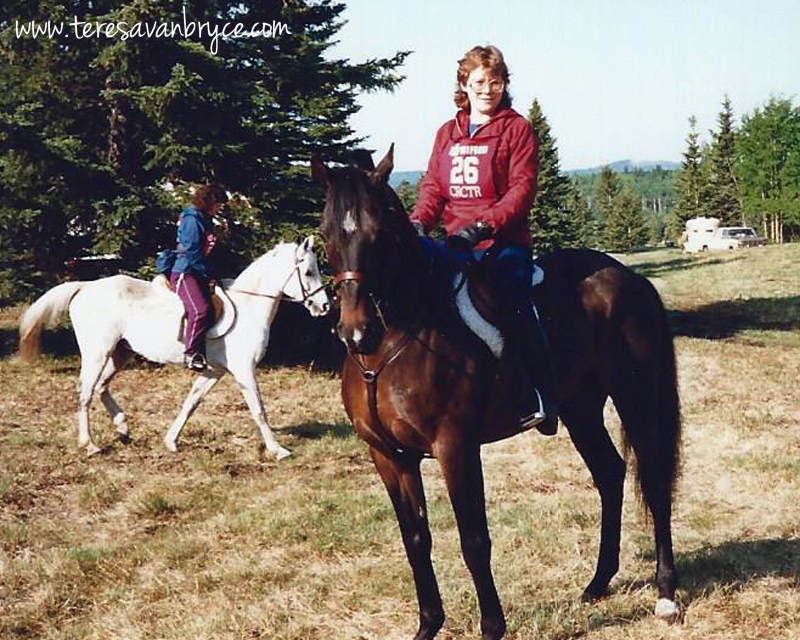 Echo and I had a busy first couple of years: the Heather Cormie clinics in the spring, competitive trail riding and showing in the summer, weekly jumping lessons over the winters with Janine Schofield, and riding five nights a week unless the temperature in the arena was unbearable. 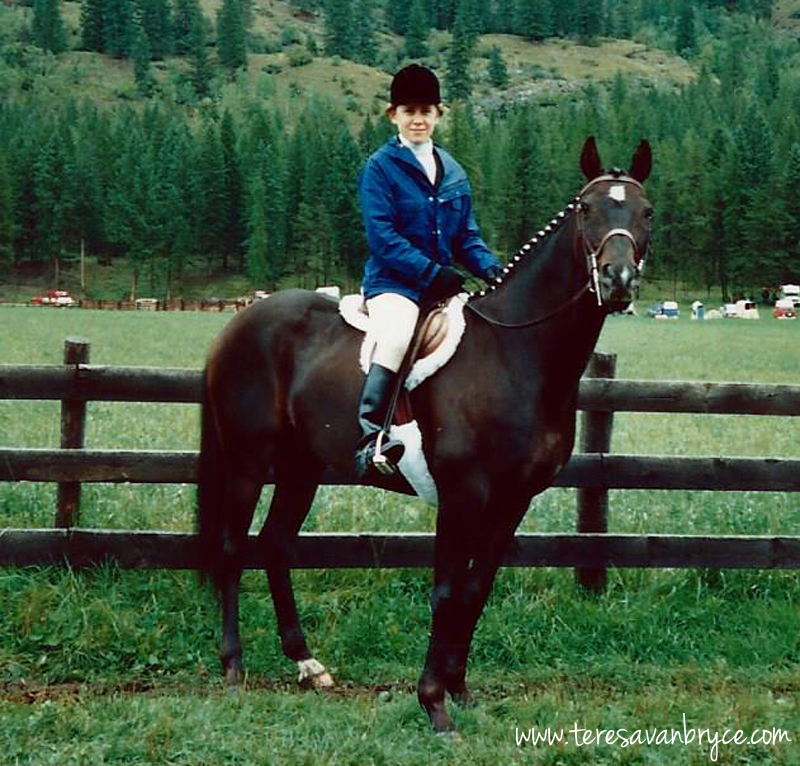 By the spring of 1989, we’d done enough jumping that I felt we were ready for a new challenge, 3-day eventing. For those not familiar with this sport, it involves three events over three days–dressage, cross-country jumping, and stadium jumping. It’s a supreme test of the fitness, courage, and training of both horse and rider. I signed up for a 3-month eventing program at the Black Diamond Ranch and moved Echo there in March. A few days into his stay at Black Diamond, I drove down to see him with my then boyfriend along for the ride. Echo seemed pretty energetic but energy and Echo were synonymous, so, when boyfriend asked to take him for a spin around the arena I thought, why not? Despite my coaching, boyfriend let the reins hang loose and after a turn or two I could see Echo’s energy building. Echo broke into a trot. I coached again that boyfriend should take more contact but now he was bouncing around a bit and having some trouble pulling on the reins. When Echo broke into a run, boyfriend let go of the reins, grabbed the front of the English saddle and held on, leaving me shouting useless directions in the middle of the arena. He stayed on for the first trip around but when Echo made a slight move toward the exit gate, off went boyfriend into the wall and then the dirt. He was unhurt, Echo slowed down as soon as he was off, and I learned that Echo had been chowing down on a gallon of oats a day, more oats than he’d probably seen in his life. He was not a horse that needed extra fuel. As it turned out, my Echo was a clever fellow and may have been showing me it was time to chuck the boyfriend via a visual demonstration, since that’s what I did just a few months later. Echo excelled in the cross-country portion of the event training. Brave, fast, athletic. He had the stuff. The only obstacle that ever bested him was a very solid-looking log structure. He took off from the ground but then changed his mind mid-jump and stopped, sending me catapulting over the jump. He landed on top of the corner post and was bruised but not seriously injured, I walked with a limp for a few days because of the hip I’d landed on, but we recovered and were back in training the following week. Our first competition was at Black Diamond Ranch, a mini-event with all three segments of the competition in one day. We started off strong when Echo surprised me with an excellent performance in the dressage ring. His hot temperament made the precision of dressage a challenge, but on that day, he aced it and put us high in the rankings. Just a few hours after the dressage test, we were on the cross-country course, and we moved further up in the placings. We had a chance to be in the ribbons! The third segment, the stadium jumping. 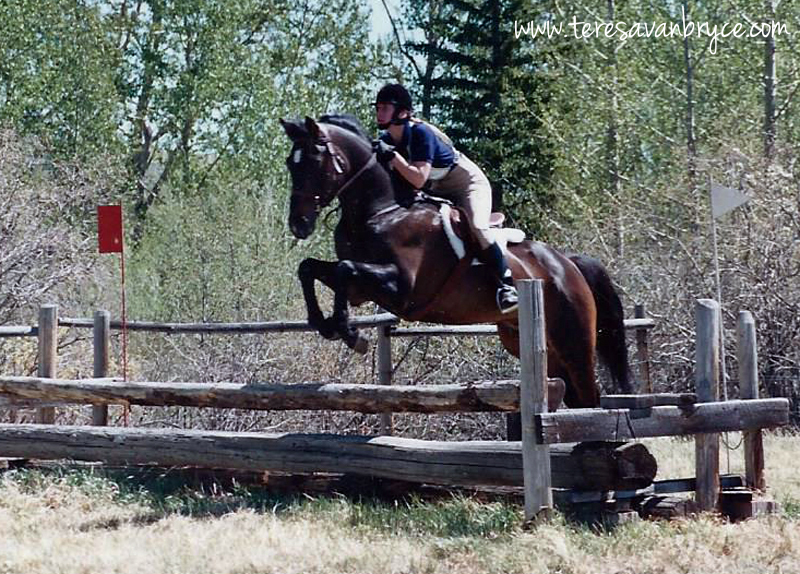 A test of the horse’s ability to change gears from galloping cross country to jumping a tight course over obstacles that fell down when bumped. Well, with three events in one day, the excitement of the cross country was still buzzing in Echo’s brain when we got to the stadium. Have I mentioned that Echo loooved to jump? Oh my, yes. His speed increased right along with his enthusiasm and we knocked down enough rails to take us out of the ribbons. We finished seventh overall, not bad considering there were more than thirty competitors and it was our first event. Echo the Wonder Horse had retained his title. 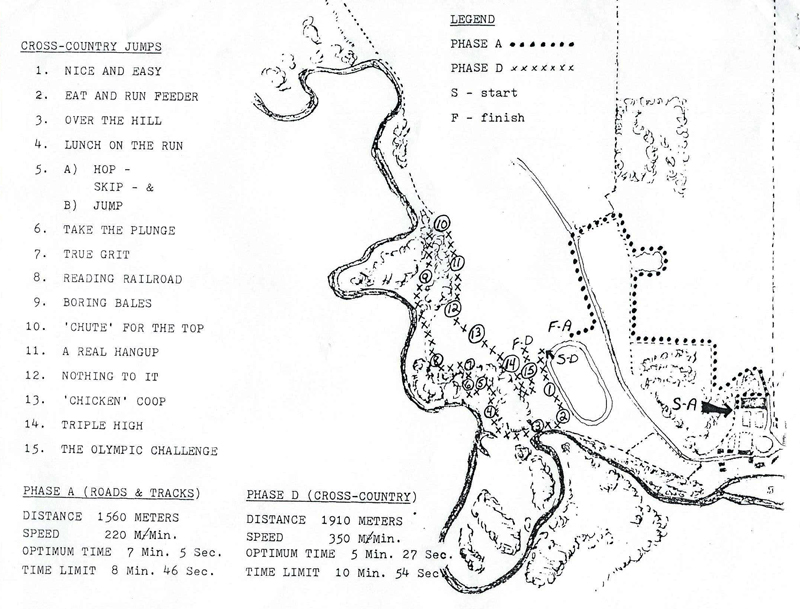 Our next competition was at Fort Steele near Cranbrook and this 2-day event combined the dressage and stadium jumping into one day with the cross country following on day two. Hm…no opportunity for Echo to get into gallop-brain until I needed it. Perhaps a chance for us. But, monsoon rains messed with my best-laid plan. After reasonable performances in the boggy dressage ring and slippery stadium, we set out on the cross-country course. We were doing okay until we came to a large, log obstacle much like the one that had intimidated Echo back home, but this one was located at the bottom of a slick downhill stretch, making it extra tricky. And here, Echo did something extremely rare in his jumping career, he refused. I circled him around and tried again, he refused again. Last chance. I tried approaching the jump from a different angle, one I thought made it appear less imposing. He refused a third time and we were eliminated. The competition was over for us but I was pleased with his performance in very difficult conditions. 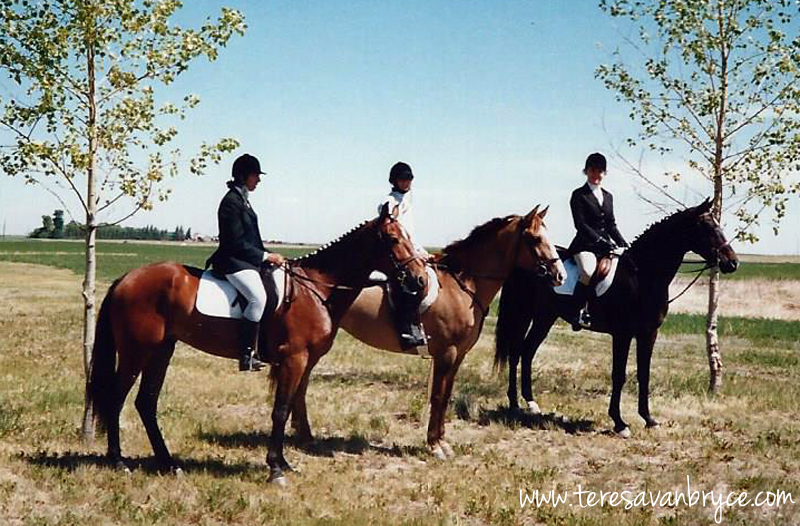 Our third event was Leduc in September, the last of the season. The result was very similar to our first one–good in the dressage, excelled in the cross-country, but fell apart again in the stadium. Something we’d have to work on for the following year … or not. The last of the season turned out to be the last of our career. 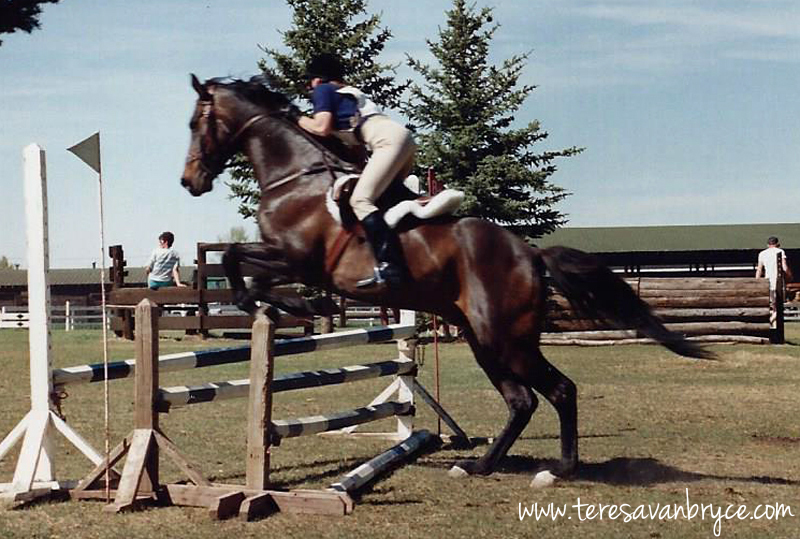 In 1990 I was Australia-bound with my backpack, and Echo was leased to a young rider keen to start jumping. Who better to teach her than Echo the Wonder Horse?